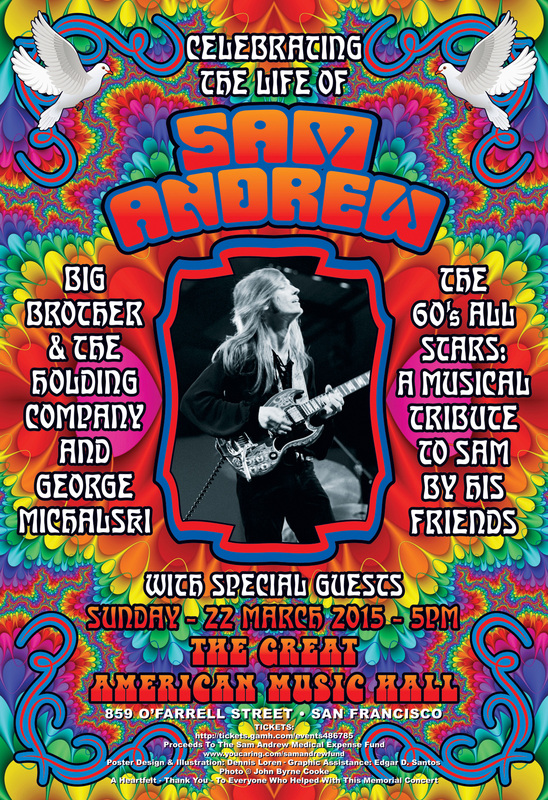 Sam Andrew, a founder of Big Brother and the Holding Company passed away on February 12 at the age of 73. Along with the Grateful Dead, Jefferson Airplane and Quicksilver Messenger Service, Big Brother, is arguably one of the most famous and successful bands from the 1960s San Francisco music scene. He is survived by his wife, Elise Piliwale (and daughter Mari Andrew, from a previous marriage) who contacted Dennis Loren to design this poster for Sam’s memorial concert on Sunday March 22, 2015 at the Great American Music Hall. I spoke with Dennis who is deeply honored to do this poster in memory of his longtime friend. Elise said that it made her very happy to see the finished design and that Sam would have loved it. The art will be printed by PS Print in Oakland and available at the memorial. John Cooke, former road manager for Big Brother, will share some special Sam memories and a rare 60s film of the band. Jordi Blanch liked this on Facebook. Kerry Morgan liked this on Facebook. Mike Busbin liked this on Facebook. Scot Purdy liked this on Facebook. Leprechaun’s Gate liked this on Facebook. Alberto Lobera Mellado liked this on Facebook. Colin MacDonald liked this on Facebook. Spacetime Robert liked this on Facebook. Mathew Herbert liked this on Facebook. Len Massey liked this on Facebook. Beach Runner liked this on Facebook. Andy Bromberg liked this on Facebook. Dave Siebert liked this on Facebook. Mikel Mann liked this on Facebook. Richard Titus liked this on Facebook. Christopher R Lee liked this on Facebook. Gregory Moran liked this on Facebook. Paul R Getto liked this on Facebook. Robert Gluckson liked this on Facebook.